An overvalued exchange rate implies that a countries currency is too high for the state of the economy. An overvalued exchange rate means that the countries exports will be relatively expensive and imports cheaper. An overvalued exchange rate tends to depress domestic demand and encourage spending on imports. 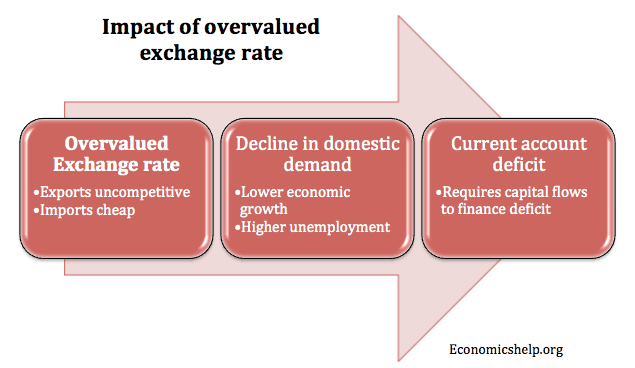 An overvalued exchange rate is particularly a problem during a period of sluggish growth. If the economy is booming, an overvalued exchange rate can help reduce inflationary pressure, but in a recession, an overvalued exchange rate can cause further deflationary pressures. In 2011, both Switzerland and Japan witnessed an appreciation in their currency. This appreciation occurred because investors were worried about finding secure investments in a period of economic uncertainty. However, because the global economy remained depressed (slow growth, high unemployment), this appreciation was unwelcome. It makes it more difficult to export goods and can lead to lower growth. For an economy like Japan which relies on a strong export sector, this decline in competitiveness could be damaging to their economy. This is why both Switzerland and Japan sought to intervene to try and reduce the value of their currency. 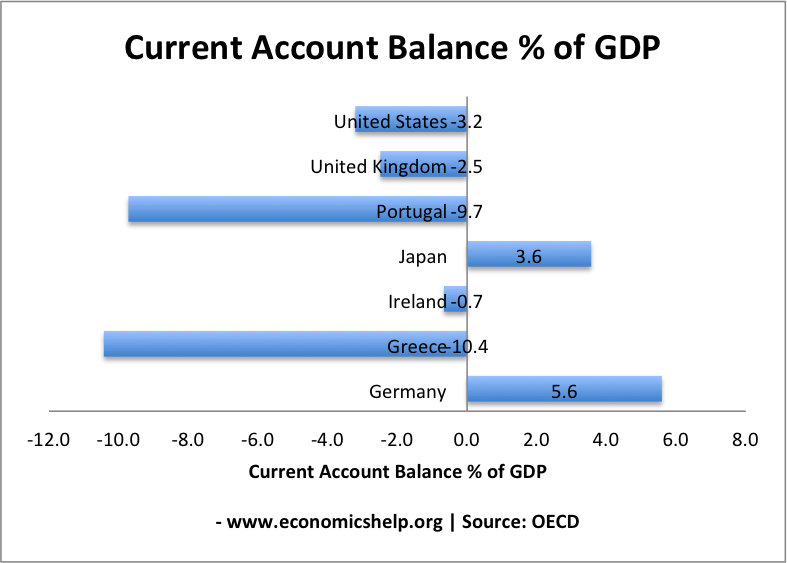 In 2010, countries like Portugal and Greece ran a current account deficit of close to 10%. This is because they didn’t have their own exchange rate to enable a depreciation. In the Euro, they faced an overvalued exchange rate. Greece and Portugal became uncompetitive because they had relatively higher inflation rates than other Eurozone economies. For example, rising labour costs not met by improved productivity. If they had their own exchange rate, we would see a devaluation in the currency making exports more competitive and imports cheaper. This would help reduce the size of the current account deficit. For example, the UK has had a persistent current account deficit, but with an independent exchange rate, the exchange rate can depreciate to reduce the size of the deficit. The problem is that in the absence of a floating exchange rate it becomes more painful to solve the current account deficit. To regain competitiveness, Greece and Portugal will have to rely on deflationary policies. For example, higher tax and lower spending to reduce consumer spending on imports. Also by reducing inflation, this makes exports more expensive. The problem is that it requires a prolonged period of deflation to regain competitiveness. Also, deflation will bring other problems such as low growth, high unemployment. 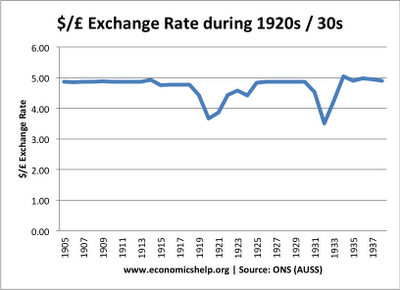 In 1925, the UK rejoined the gold standard at the same level as pre First World War. It was hoped that the gold standard would give the economy stability and low inflation. However, economists generally agree the UK joined at the wrong rate. 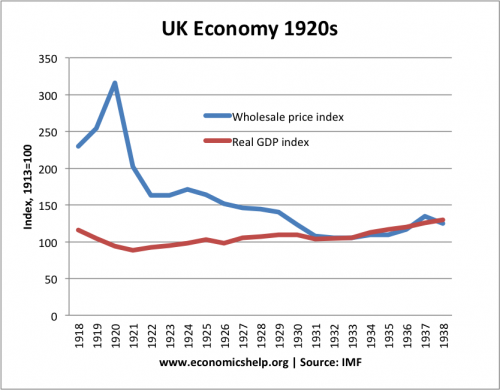 Since the First World War, the UK had seen a decline in competitiveness and the market level of the Pound had fallen. To keep the value of the Pound at the Gold Standard level of £1 = $4.85, real interest rates needed to be very high. But, high-interest rates led to depressed demand and lower economic growth. The overvalued exchange rate also make UK exports uncompetitive, leading to a fall in manufacturing output. Firms responded to over-valued exchange rate by attempting to cut nominal wages. This cut in wages led to the General Strike of 1926. 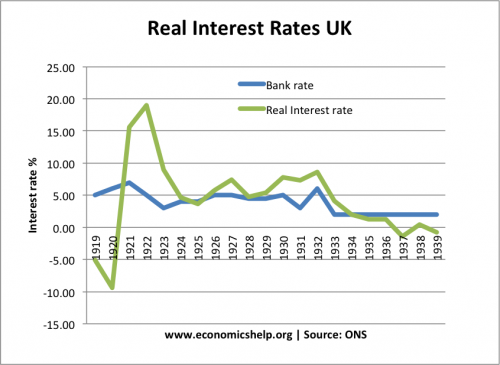 Partly due to the overvalued exchange rate, the UK experienced high unemployment, low growth – even before the Great Depression. Real GDP was stagnant in the 1920s. This entry was posted in currency, economics. Bookmark the permalink.